This bright contemporary and new villa offers exceptional services. Its new heated swimming pool of 15 m, with rolling shutter, its site populated with hundred-year-old olive trees, its panoramic sight on the littoral and the nearness of the village make it an idyllic holiday resort. It is perfect for 2 families, and can accommodate 10 people in its 5 bedrooms. The villa, 260 m2 on 2 levels, is installed on a plot of 1600 m2. It is furnished with a vast living room-library with American kitchen, large picture windows on the done up terrace. 5 large bedrooms (3 doubles, 2 to 2 singles), 4 bathrooms and 4 separate toilets ensure your comfort. The green setting embalms the swimming pool of 15x4 m. The villa is remarkably equipped. Music everywhere (multi-room system), steinway grand piano, computer and wifi, TV and Blu-ray player, library and CDThèque. Remote controlled shutters, solarium, barbecue, terraces complete the comfort. The charming medieval village, Tourrettes-sur-Loup, is a 5-minute walk away. Luxury, calm and pleasure describe your stay. please note that we ask for a 1000 euro cash deposit to be paid in cash / chech on arrival. Refunded on your departure day. Please note that we ask for a 1000 euro deposit. Many thanks. We have a fantastic baby sitter to recommend! We had a really lovely time and thoroughly enjoyed ourselves. House was comfortable and pool was great. Views fantastic. Location gave easy access to village. Lighting to terrace puzzling in the evenings- usually went off 3 times before behaving itself!! Gold stars to boulangerie and boucherie. Piano and library were an added bonus as were the cuddly toys (loved by the grandchildren). All in all a wonderful holiday. The location and pool are the absolute best things about this property. Beautiful pool and patio area (if a little cool in the water! ); astroturf lawn looks good and is practical but can get very hot to walk on. This 'upside down' house offers stunning views towards the coast, with living on first floor and most sleeping below, was pretty well appointed with an amazing book collection. It worked well for us with grown up children although we weren't aware that one of the double rooms was completely self-contained (used out of peak season as an airbnb). This was a bit of a nuisance at times but not a major problem for our family set up. Living area was excellent and kitchen was good/ok - extensive work surfaces, large fridge freezer and good ovens, a bit light on basic cooking utensils and good wine glasses so we ended up buying a few and leaving for future guests. Some attention is needed to exterior decking area but we understand this is already planned and the stairgate at top of the stairs and handrail are a bit precarious! We did struggle a bit with the heat as the house isn't air conditioned but the lovely and ever helpful Agnes provided us with an extra fan. The location of this house is superb, it's just half an hour from Nice airport and the village of Tourettes is a 6-7 minute walk down/uphill. The village itself is charming and picturesque with stunning views, very well looked after and welcoming. It has good basic shops (Vence's bigger supermarkets just a 10 min drive) and delightful craft and gift shops in its historic medieval streets. We had some excellent meals at some of the village's numerous restaurants. Lots to see and do in the area - we tried canyoning in the gorge (not for the faint hearted! ), visited other local villages as well as Monaco and Antibes. A guest/ visitor comments book in the house would have been helpful to provide good tips from previous visitors. All in all we had a great holiday - thank you. Magnificent view, perfect house for our family of teenagers, grandparents and kids....enchanting village, unforgettable food...but most of all our hosts were fantastic. Thank you Emmanuel and Isabelle. My family and I had a lovely holiday experience in Isabelle and Emmanuel's beautiful villa, perfectly situated on a mountain in Tourrettes Sur Loop. From the villa's large terrace we enjoyed the tranquility and the wonderful view of Nice / Cannes and the sea, which could be seen from the villa's large terrace. The villa is only 5 minutes. From the ancient medieval city, which is incredibly beautiful and definitely requires a visit. The villa is equipped with all the necessary things you need and much more. We loved staying on the villa's terrace and not least in the large swimming pool. Our expectations were fully met, no problems - all the formalities were ok.
A super villa, which we hope to come back to. We (2 families with 4 adults and 5 kids) had a wonderful holiday in July 2018. 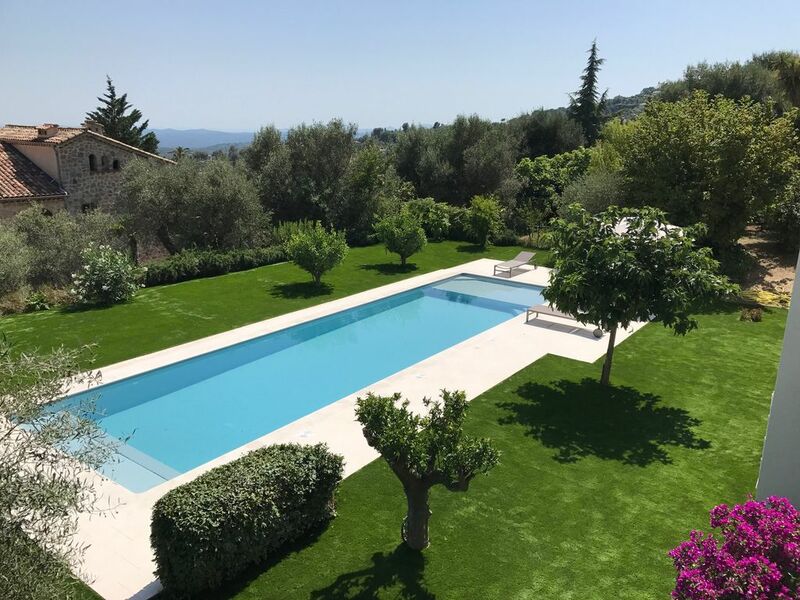 The villa is very spacious and well equipped, the pool is brand new, delicate and large, the outdoor ping pong table was a real hit and Tourettes-sur-Loup is such an amazing village. So why "only" four and not five stars? It's the smaller things, like (1) no direct access from the kitchen to the garden and pool area, (2) no view from the pool area (only from the upper floor), (3) lack of air condition (not a big problem, though) and (4) the feeling of living in someone's home. Nevertheless, this is a villa we would be happy to recommend to anyone! Villa comfortable au calme avec une vue magnifique sur la méditerranée. La villa est récente avec toutes les commodités. La vue à180 degré sur la méditerranée est également éblouissante. De belles ballades sont possibles depuis la propriété. La villa est une garantie pour passer de bonnes vacances. Many artists have stayed at Tourettes and the village retains a significant artistic and craft. A 7 kilometers from Saint Paul de Vence, you are 20 minutes from the sea and 1/2 hour from Nice. Excursions, golf, tennis, paragliding, water skiing and swimming are within your reach. please note that we ask for a 2000 euros security deposit on arrival. It is refunded on your departure day.